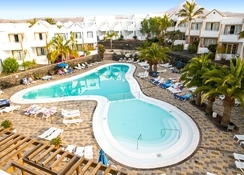 Previously known as the Sol Morromar, the Morromar Apartments were renovated in 2004 and are ideally located in the Matagorda area of Puerto del Carmen. The apartments are only a 5-minute stroll from the nearest beach. Benefiting from being in a quieter region of Puerto del Carman, holidaymakers that want a tranquil holiday whilst also being a short taxi journey away from the main town will love the Morromar's location. Inspired by the emblematic Lanzarote architecture, it features 221 rooms available in numerous categories and they are spread over several buildings. Additionally, the hotel houses two swimming pools, a buffet restaurant, a lobby bar, a pool bar, a gym and numerous sports courts. All the family will enjoy a unique experience in a serene environment at the Morromar Apartments. The Morromar Apartments are situated in Puerto del Carmen, Las Palmas, Spain. It is just a short-drive away from Arrecife. This magnificent hotel is only five minutes’ drive away from the Playa de Matagorda, it is a famous family beach with golden sand, where you can take a pleasant stroll. The Lanzarote Airport is only 2.1km away from the hotel. The Morromar Apartments features 221 contemporary and spacious apartments. These apartments fall in three categories namely One-bedroom apartment, Two bedroom apartments and Studios. Some of the facilities in the apartments and suites include balcony, bath, hair dryer, soap, towels, kettle, phone, TV, safe, fan, fridge, toaster, electric kitchen, microwave, cookware, clothes line, table + iron, sofa, sofa bed, cleaning, change of sheets, towel change and Wi-Fi. The hotel houses a buffet restaurant serving breakfast, lunch and dinner in a cosy and relaxed setting. Other than this, there is a pool-bar and lobby bar, where you can have refreshing drinks as well as alcoholic beverages. If you want to explore more then take a stroll around the hotel to find some of the restaurants and bars like The Sportsman Bar Lanzarote, Decky Dillion’s and the Auld Triangle. The Morromar Apartments has ample sports, entertainment and leisure facilities to keep you occupied throughout the day. Take a refreshing swim in one of the two outdoor swimming pools, where you will also find sun loungers dotted across the pool. Children too can have a lot of fun in the kid’s pool. There is a wide range of sports facilities including tennis, volley ball, soccer, billiards, game room, darts, running track, petanque and table tennis. Those who want to maintain their fitness level can do this in the fully-fledged fitness centre. When it comes to entertainment the hotel is one of the best in the region with some entertainment facilities like show animation, excursions, live music, mini children’s disco and mini children’s club. Guests can also play golf in the Lanzarote Golf Resort which us only 3.3km. We had such a wonderful time here, great service, drinks all throughout the day, lovely staff and was just a great atmosphere. The pools were also lovely and would definitely return! Check in was easy and the reception staff were very friendly. We even got a free upgrade on our room which was a lovely surprise. The room was big and light which a nice balcony. the mirror is in completely the wrong place to get ready so either take your own or take it off the wall and put it somewhere else. Bed was comfy. Needed and extra pillow tho for me. Pool was cold every day and not enough sun beds for everyone but this didn't bother us as we were out and about a lot of the time. The food was ok. couldn't find fault with it at all. The Chinese theme night was particularly good. Good location to nearby shops and the beach or walk left when you get to the sea front and you can see the airplanes landing. You can hear planes but it's not massively loud and doesn't upset your holiday at all. Lots of children but it's a family hotel. The entertainment was the worst I have ever seen. Mostly in Spanish and on very late and generally rubbish. Didn't bother us as we sat at the back just talking and drinking or outside. The drinks were ok quality. For branded drinks you pay €2 more I think. Rubbish they are given in cardboard cups tho. Went as a couple and only paid a total of £500 for both of us including flights on an all inclusive basis for 4 nights. I would stay there again as it was basic but clean and friendly. Got a good deal from teletext holidays 7 nights all inclusive. Apartment had sea view as previously requested by email and all the facilities we needed. Nice and clean, towels changed regularly. Food was varied enough and what you would expect from all inclusive. Beach just a few minutes walk away and taxi rank just outside back of hotel. Great stay there, staff friendly and helpful, would stay again. The hotel was clean and welcoming. Staff were helpful and friendly, nothing was to much trouble. Had a lovely relaxing holiday. Every thing you would expect from a all inclusive. Food good service good only down side adult pool bar was closed. Loved every minute apart from the evening entertainment but plenty on at night 10 mins away . Food really nice, apartment immaculate and staff full of smiles.